You can also have a look at the whole 1920 or at June 13 across the years. Have a look at the old newspapers from 13 June 1920 and get them! Get a FREE Numerology report based on the digits of 13 June 1920! Which were the important events of 13 June 1920 ? Knut Nordahl: Sweden -- Soccer player (1948 Olympics - Gold Medalist). Desire Keteleer: Belgium sport Champion. Eiji Okada: Actor (Traffic Jam, Yakuza, Ugly American). Rolf Huisgen: German chemist and academic. Iosif Vorovich: Russian mathematician and engineer (d. 2001). Essad Pasja: Albanian military man / minister, murdered at peace confer. ...and if 13 June 1920 was your Birth Date then Join our Birthday Club! 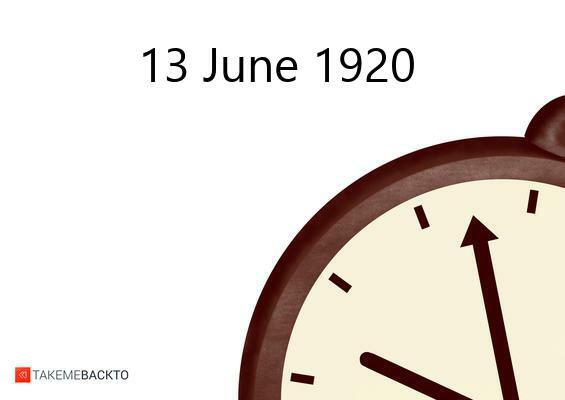 Tell the world why 13 June 1920 is such a special date for you!